This fall, the People’s Law School launches the first two of its Access to Restorative Justice Community Forums on the Haida Gwaii Islands. The forums, held in partnership with the Haida Gwaii Restorative Justice Program, will take place in Queen Charlotte City on September 15, 2015 and in Masset the following day. Additional restorative justice forums are scheduled for later in the fall in Prince Rupert and Terrace. How can victims of crime and offenders have better access to the restorative justice approach? What needs to be done to strengthen the relationships between police-based victim services and restorative justice agencies? Restorative justice seeks to repair the harm caused by crime by addressing the needs of victims, engaging the community in the justice process, and encouraging dialogue and healing. Restorative justice involves bringing together the victim, offender and members of the community to discuss the effects of the crime. At a restorative justice session the focus is on the impact of the crime and how to address the harm that was done. In this approach, crime is understood not only as breaking the law, but as a violation of people, relationships and a disruption of the peace in the community. Restorative justice principles draw from Aboriginal experience and tradition, including the belief that the community has primary responsibility for addressing crime. You can find a description of restorative justice on the JusticeBC website. Who is involved in the forums, and how do they work? The People’s Law School’s Justice Theatre will participate in the Access to Restorative Justice Community Forums by presenting a dramatized criminal trial with a restorative justice element. 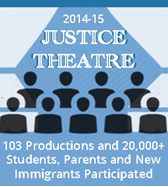 Justice Theatre is a troupe of professional actors who perform dramatizations of trials at schools and to community groups throughout BC. A panel discussion after the Justice Theatre performance will include representatives from restorative justice agencies and police-based victim services, First Nations court workers, and in some instances a school counsellor or administrator, a police officer, and a crown counsel. The panel discussion and audience Q & A period that follows will explore a range of issues, such as common barriers to the greater use of restorative justice, and how to enhance procedures for restorative justice and victims of crime. With the Access to Restorative Justice Community Forums, People’s Law School is also exploring ways that it can support the efforts of the Legal Services Society in its work with Aboriginal communities. Legal Services Society is hosting a number of community dialogues this year to develop a better understanding of justice needs in Aboriginal communities. We will be sharing with LSS insights gained from the restorative justice forums, as well as raising awareness about their new initiative: Clear Skies: A Family Violence Story. Clear Skies is a graphic novel and video about family violence and learning your legal options when in an abusive relationship. Marnie and her kids live with family violence. But with the support of her community, and by learning about her legal options, Marnie is able to leave an abusive relationship. Clear Skies is Marnie’s story. See the Legal Services’ Society website for more information on Clear Skies and how to order the order the graphic novel or watch the video. Check out the PDF version via Clicklaw. Do you know how a Bill becomes Law in Canada?